In this honest and stunning novel, now a major motion picture directed by Barry Jenkins, James Baldwin has given America a moving story of love in the face of injustice. Told through the eyes of Tish, a nineteen-year-old girl, in love with Fonny, a young sculptor who is the father of her child, Baldwin’s story mixes the sweet and the sad. Tish and Fonny have pledged to get married, but Fonny is falsely accused of a terrible crime and imprisoned. Their families set out to clear his name, and as they face an uncertain future, the young lovers experience a kaleidoscope of emotions–affection, despair, and hope. 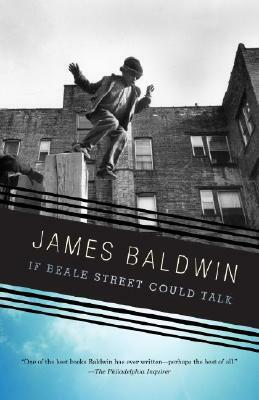 In a love story that evokes the blues, where passion and sadness are inevitably intertwined, Baldwin has created two characters so alive and profoundly realized that they are unforgettably ingrained in the American psyche. James Baldwin was born in 1924 and educated in New York. He is the author of more than twenty works of fiction and nonfiction, including Go Tell It on the Mountain; Notes of a Native Son; Giovanni’s Room; Nobody Knows My Name; Another Country; The Fire Next Time; Nothing Personal; Blues for Mister Charlie; Going to Meet the Man; The Amen Corner; Tell Me How Long the Train’s Been Gone; One Day When I Was Lost; If Beale Street Could Talk; The Devil Finds Work; Little Man, Little Man; Just Above My Head; The Evidence of Things Not Seen; Jimmy’s Blues; and The Price of the Ticket. Among the awards he has received are a Eugene F. Saxon Memorial Trust Award, a Rosenwald Fellowship, a Guggenheim Fellowship, a Partisan Review Fellowship, and a Ford Foundation grant. He was made a Commander of the Legion of Honor in 1986. He died in 1987. "A moving, painful story, so vividly human and so obviously based on reality that it strikes us as timeless."